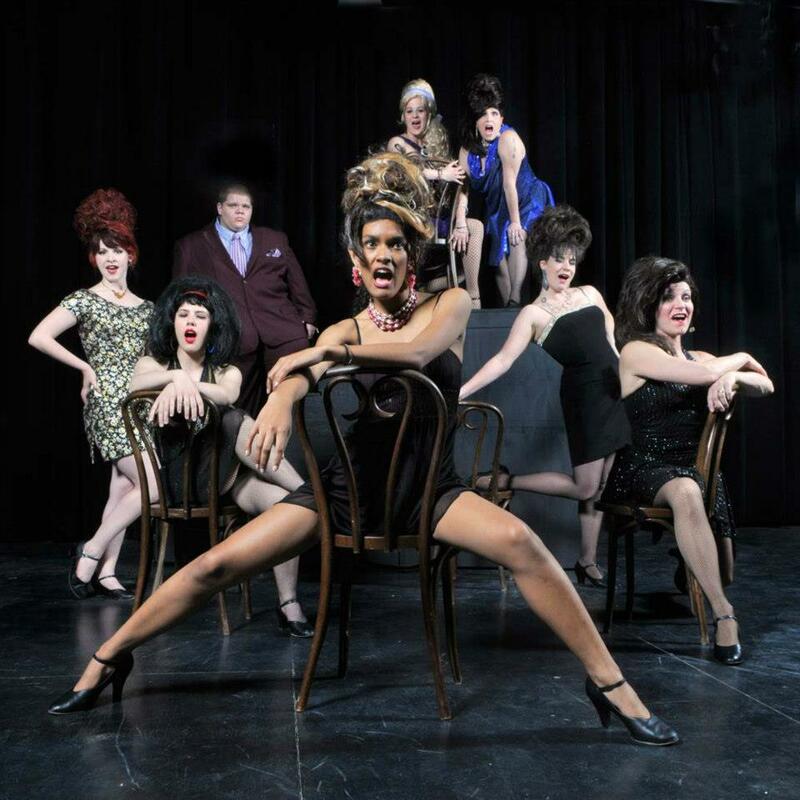 "Sweet Charity" has everything to offer the audience, and Musical Theatre Southwest's production, with a score by Cy Coleman and book by Neil Simon, revives a piece of the '60s for audiences at the African American Performing Arts Center (AAPAC). Charity Hope Valentine has no luck when it comes to men. But it's her charming nature and down to Earth personality that win people over, time and again, everywhere she goes. Played by Stephanie Burch, the role requires a strong actress who can sing well, and dance even better, which Stephanie delivers in plentitude. With support from the Fan Dango dance hall girls where she works, most notably the friendship between Helene (Stevie Nichols) and Nickie (Dawn Durkin), Charity's unflagging optimism and her love for all comes through. The trio they share for "There's Got to be Something Better" allows their dynamic to shine, showcasing the women's strengths. "Without love, life has no purpose," and so Charity finds herself falling in love...again, and again. Playing opposite her are Bryan Daniels as Vittorio, as well as Leonard Hughes as Oscar, who is perhaps Charity's best hope at finding a love match. The variety of situations written into the script allow for comedic elements to intertwine with dramatic moments for each of the men as they interact with Charity. Noteworthy cameo roles are also a part of this musical, with Tim Nuzum's strong performace as Daddy Brubeck, singing,"The Rhythm of Life," a hippie piece, and Brian Clifton's Herman, the gruff dance hall manager who heartfully reveals in song, "I Love to Cry at Weddings." 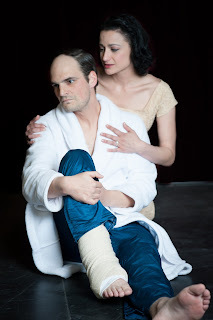 Classic works make for unique challenges for actors, especially when so many before have brought their interpretation to long standing roles such as Tennessee Williams' characters in "Cat on a Hot Tin Roof." Tackling this challenge, local actors Kate Costello and Peter Diseth are currently navigating their own course as the iconic couple Brick and Maggie Pollitt over at Albuquerque Little Theatre, playing until April 28th. Spying, lying and deceit are constant themes throughout the play, and watching how each of the characters choose to manipulate each other by what they reveal, and what they conceal, keeps the 1955 setting relevant to today's audience. Maggie carries the majority of the first act, a daunting challenge that Kate effectively meets, while Peter, as Brick, must remain relevant to the scene, and to Maggie, often without saying a word. When supported by strong actors in the roles of Big Daddy (Tom Pentecost) and Big Mama (Carolyn Hogan), the directions of the play range from sinisterly comic to darkly dramatic. 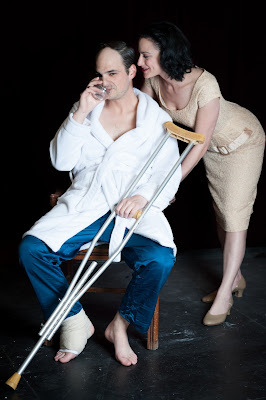 Brick's cry for his crutch as he lunges for the bottle, and glimpses of Big Daddy's own abusive behaviors when alone with Big Mama shade the work darkly, allowing the actors to successfully push the storytelling beyond the script itself. Big Mama's desperation to make things alright easily becomes a pathetic attempt to thwart Big Daddy's rages, and Maggie's desperation to connect with Brick, who withdraws from her every attempt, only reveals and exacerbates her own insecurities. In true Southern style, it takes strangers to deliver the distasteful truths, to reveal the lies and to bring forth the issues that the family can't bring themselves to discuss, despite what they already know. Directed by Denise Schulz, the show builds to the end, with exquisite lighting design by Ryan Jason Cook which is especially noteworthy, a moonlit backdrop which turns from a balmy, Southern night to a dark and stormy Summer squall. The show runs Friday, Saturday and Sunday until April 28th, as well as a Thursday performance on April 25th. 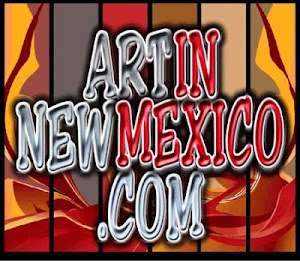 For tickets and info online, visit albuquerquelittletheatre.org or call 505-242-4750. It was an evening of world dance, as Farfesha studio presented their 11th annual student showcase, featuring nearly 80 performers, both students as well as teachers and choreographers, at the South Broadway Cultural Center on Saturday. Folk dancing from many countries and cultures around the world were skillfully presented, allowing performers of all ages, body shapes, and abilities to gain confidence in displaying their art on stage. Belly dance (or Oriental dance) was not the only type of folk dancing featured, but a more global approach to the evening included hula and flamenco as well, the same as their studio offers, and dancers danced in everything from cowboy boots, to character shoes, and of course, barefoot. Prop work is essential to many of these works, so everything from veils, shawls, sticks and swords were used throughout the evening. Strong solos, as well as small group and larger ensemble pieces made for a varied program, and dance legend Amaya had a guest performance, a veil dance in the 2nd act, which provided another highlight to the evening. While photos were prohibited, I did get this shot during intermission, which was adorable! It is always a joyful experience to see performers learning to present their work to others, and fascinating how one's eye is drawn to different dancers. Regardless of age or body type, there is such beauty to be found in any dancer who owns their movements, which Farfesha's students understand. And with bows set to the "Harlem Shake" they left the audience smiling. 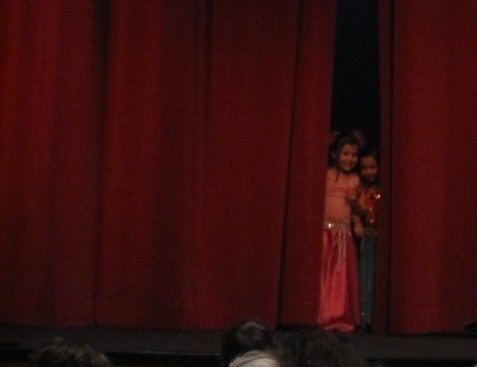 For more information about Farfesha Belly Dance visit http://www.farfesha.com.